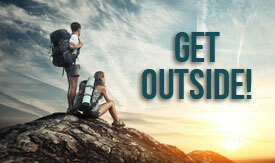 Check out this article, if you want your brain to work better and be stronger, you need to spend time outside. The scientists agree (http://www.umich.edu/~jlabpsyc/pdf/2008_2.pdf ). Most of us feel better after a lunch break outside or in the park, not mention how good you feel after a hike in the woods or run. Our cognitive abilities are improved and that results in good things. You have better productivity at work while feeling more relaxed and stress free. Do you want your state of mind to be happy, focused and creative? Check out this article and what some researchers say. Justgoutside!